The chapters in this volume are based on presentations made at a recent conference on cognitive and linguistic foundations of reading acquisition. The researchers who participated have all made contributions to the theoretical and empirical understanding of how children learn to read. They were asked to address not only what they have learned from their research, but also to discuss unsolved problems. This dialogue prompted numerous questions of both a theoretical and applied nature, generated heated debate, and fueled optimism about the important gains that have been made in the scientific understanding of the reading process, especially of the critical role played by phonological abilities. Contents: Preface. Acknowledgments. List of Contributors. Part I: Theoretical Foundations. A.M. Liberman, How Theories of Speech Affect Research in Reading and Writing. S.A. Brady, Ability to Encode Phonological Representations: An Underlying Difficulty of Poor Readers. P. Tallal, S.L. Miller, W.M. Jenkins, M.M. Merzenich, The Role of Temporal Processing in Developmental Language-Based Learning Disorders: Research and Clinical Implications. M. Wolf, A Provisional, Integrative Account of Phonological and Naming-Speed Deficits in Dyslexia: Implications for Diagnosis and Intervention. Part II: Subtypes of Dyslexia. J.M. Fletcher, R. Morris, G.R. Lyon, K.K. Stuebing, S.E. Shaywitz, D.P. Shankweiler, L. Katz, B.A. Shaywitz, Subtypes of Dyslexia: An Old Problem Revisited. K.E. Stanovich, L.S. Siegel, A. Gottardo, P. Chiappe, R. Sidhu, Subtypes of Developmental Dyslexia: Differences in Phonological and Orthographic Coding. Part III: Beginning to Read and Spell. M. Bruck, F. Genesee, M. Caravolas, A Cross-Linguistic Study of Early Literacy Acquisition. L.C. Ehri, Sight Word Learning in Normal Readers and Dyslexics. R. Treiman, Spelling in Normal Children and Dyslexics. P.E. Bryant, T. Nunes, M. Bindman, Children's Understanding of the Connection Between Grammar and Spelling. Part IV: Implications for Intervention. B.R. Foorman, D.J. Francis, S.E. Shaywitz, B.A. Shaywitz, J.M. Fletcher, The Case for Early Reading Intervention. B. Byrne, R. Fielding-Barnsley, L. Ashley, K. Larsen, Assessing the Child's and the Environment's Contribution to Reading Acquisition: What We Know and What We Don't Know. J.K. Torgesen, R.K. Wagner, C.A. Rashotte, Approaches to the Prevention and Remediation of Phonologically-Based Reading Disabilities. R.K. Olson, B. Wise, M.C. Johnson, J. Ring, The Etiology and Remediation of Phonologically Based Word Recognition and Spelling Disabilities: Are Phonological Deficits the "Hole" Story? K.T. Greaney, W.E. Tunmer, J.W. Chapman, The Use of Rime-Based Orthographic Analogy Training as an Intervention Strategy for Reading-Disabled Children. F.R. Vellutino, D.M. Scanlon, E.R. Sipay, Toward Distinguishing Between Cognitive and Experiential Deficits as Primary Sources of Difficulty in Learning to Read: The Importance of Early Intervention in Diagnosing a Specific Reading Disability. T. Nicholson, Closing the Gap on Reading Failure: Social Background, Phonemic Awareness, and Learning to Read. B.A. Blachman, Early Intervention and Phonological Awareness: A Cautionary Tale. 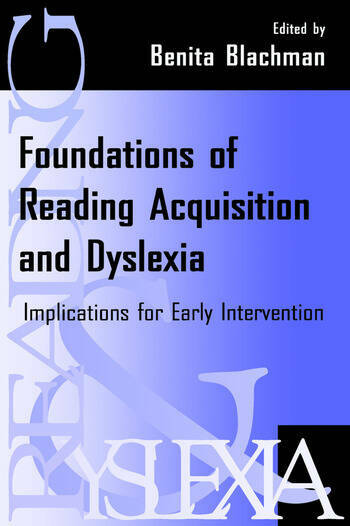 "...well grounded and cohesive in its approach to dyslexia and reading acquisition. The book is highly recommended to readers with a solid grounding in psycholinguistics, neuropsychology, and statistics or to those readers who are highly motivated and have several good domain-specific dictionaries. The information is well worth the time it takes to understand." "Many chapters...stand alone as excellent reviews. The book offers much to students of psychology and education at advanced undergraduate and postgraduate levels and is essential reading for practitioners in the field."